Kichler Lighting 10580BZ TaskWork Direct Wire 12IN 2LT 12V Xenon Undercabinet Light features a durable Bronze Powder Coat finish and Easy-Lock Poly-Tempered Frosted glass diffuser. 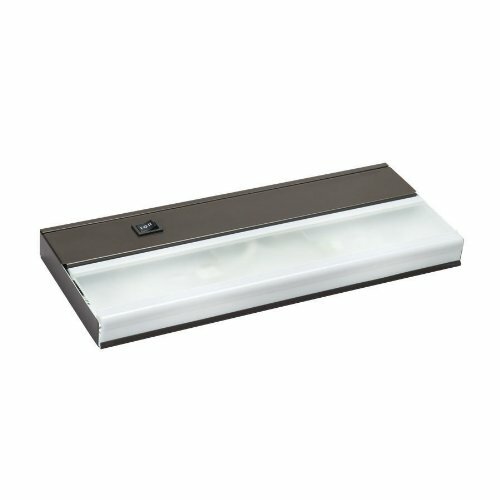 This Series II Cabinet Light is perfect for almost any application. It includes an easy to operate on/off hi/low rocker switch, and has a slim 1IN profile which makes it easy to conceal under your cabinet, and it offers fastener-free hinge assembly, and keyhole mounting for easy placement. When thinking of under cabinet lighting, most would think of their use in the kitchen. The benefits are quite extensive, and are useful in the kitchen and other heavily used areas in the home or office. They can illuminate task areas, provide ambient light, and give a pleasant accent light. A couple of less obvious reasons why under cabinet lighting is beneficial are that most under cabinet lighting is energy efficient, and it removes shadows and dark corners in a tight area. The 10580BZ is 12.25IN long x 5IN wide x 1IN high. The 10580BZ comes one per package, and includes two (2) 18W 12V wedge base Xenon lamps (dimmable using an Electronic Low-Voltage dimmer). Energy saving Xenon lamps have a rated average lamp life of 10,000 hours that evenly distribute light while producing 35% less heat than halogen bulbs. Since 1938, Kichler Lighting has offered a distinctive array of lighting solutions that reflect your individual personality, tastes and plans. Kichler brings you an unparalleled variety of exciting style families, unique finishes, fresh colors and unequaled quality. Whether it’s casual, contemporary, transitional or traditional, you’ll find it with Kichler, lighting that defines your style.